A & B Commercial Cleaning Service, LLC offers post construction clean up to commercial customers throughout the area. Whether your company is remodeling, completing a building expansion, or completely renovating a commercial space, A & B Commercial Cleaning Service, LLC will clean up the mess. A & B Commercial Cleaning Service, LLC has provided post construction cleaning for more than 4 years. From small jobs to major renovation, our crew will come in and make sure your business is customer ready. Call (717) 216-4866 today for a free post construction cleaning estimate. If you build it, we will come. Construction is messy business: plaster dust, nails, and miscellaneous construction materials everywhere. A & B Commercial Cleaning Service, LLC has a fleet of powerful cleaning equipment that will get your new workspace space looking spiffy in no time. Our cleaning crew will wash down all surfaces to completely remove dust from walls, floors, duct work, vents, ceiling pipes, light fixtures, etc. A & B Commercial Cleaning Service, LLC has been in the commercial cleaning business since 2015. Call (717) 216-4866 today for a commercial cleaning quote for your construction project or renovation. Full service post construction cleanup. 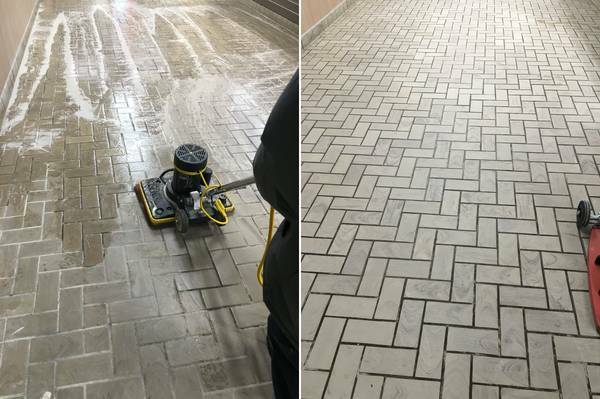 A & B Commercial Cleaning Service, LLC has provided professional post construction cleanup to commercial clients in the area for more than 4 years. Call (717) 216-4866 today to find out how easily and quickly we can get your building cleaned and ready for your customers.